This was supposed to be Toyota’s year at the 24 Hours of Le Mans, with a great start to the season and a record-setting pole run for the race. But fate wouldn’t have that, and a bizarre, poorly placed thumbs-up said to be for encouragement eventually led the dominant car to have race-ending mechanical problems. Toyota’s LMP1 program won the first two rounds of the FIA World Endurance Championship before Le Mans, and things looked like they’d finally go Toyota’s way in the big race. They were, too, for a long time: The No. 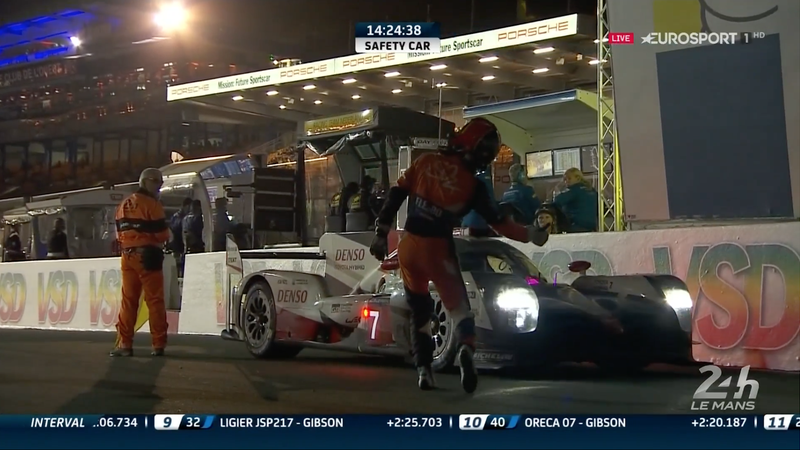 7 Toyota TS050 set the fastest lap ever in qualifying, got the pole and was leading the race with 14 hours to go. That’s when things got bad. The problem was, the driver’s racing fire suit looked almost identical to that of the marshals on pit road. Kobayashi took that as “go,” and he went. Video footage of the gesture can be seen here. Sportscar365 reports that there was confusion on the radio afterward, causing Kobayashi to have to start and stop multiple times. The Toyota TS050 Hybrid uses a seven-speed sequential transmission and the movements, technical director Pascal Vasselon said, resulted in a terminal clutch failure. 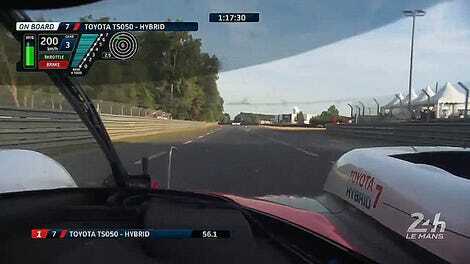 “In this case he has seen a marshal telling him to go, he went,” Vasselon told Sportscar365. “From our side, we told him stop because the safety car queue was coming, and it was not possible. “And the problem is that he was at the pit exit, so he was in pit mode where we started in electric, which is like the car was, he was in a mode which normally should not be used, so he has done several restarts with the clutch and the combustion engine. “The clutch is not made at all to do that. The clutch is to start the combustion engine with the car is at speed; it’s not to start the complete car. It was a spontaneous encouragement mark as it happens between pilots. I was fined by Stewards for this gesture and I admit it was inopportune. I regret that. Retiring from the race so early dropped the car down to 54th position overall, and that’s where the poor No. 7 Toyota finished. At the same time, the Porsche LMP1 team that had dropped to 56th overall at one point in the race clawed its way back up to first overall to win the race. Maybe next year, Toyota. Maybe next year.